Where to put your garden is a great question. 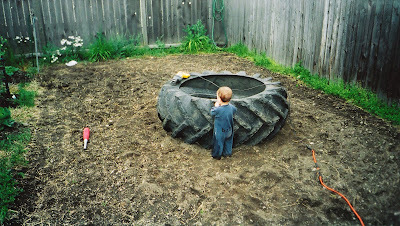 Every yard or patio has space for a garden, whether its the lawn, play area or flower garden. If you have no yard, you can grow it in containers on the patio, deck, or in widow boxes. I once read a book on edible landscaping and later cut out my front yard and began to grow vegetables within my landscaping. There are many beautiful vegetable plants, berry bushes and fruit trees to include in your landscaping. I've done everything from plant different colored cabbage plants within the flower beds (which looked great by the way) to strawberries as ground cover in different beds and under trees. If you're going to grow something, why not make it edible? The most important thing to consider is where ever you plant, you need at least 6 hours of direct sunlight or more. Some of my best gardens have been where they are south facing and against a house, fence or shed for reflective sunlight. Also, the soil should be well drained and you need a source of water. Many people keep a small kitchen garden next to the kitchen (just outside the door) with herbs and vegetables for cooking. 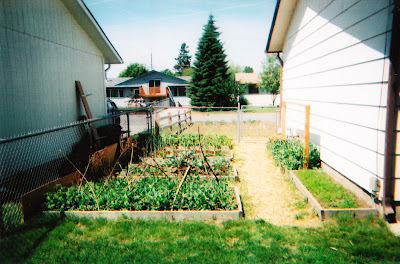 Then if they have the space they, they also grow a larger storage garden for putting up some food storage (i.e. canning, drying and freezing). Remember you can put a garden just about anywhere, even on a roof as long as you have the sunlight, most everything else can be brought in. Building a raised bed out of cinder blocks is easy and if you watch the local classified ads you can probably get the material for free (I did for this one). Also, cinder block raised beds have the added advantage of creating thermal mass which stores heat and warms the soil longer. Here's a 4x5ft cinder block raised bed garden I built for a spice garden. Step one is lay the blocks in a rows. Try to make the blocks level by clearing the dirt. I wouldn't go any wider than 2 blocks and then the length is up to you. This one is shorter because I'm using it for a spice garden and then I want to trellis cucumbers behind it against the fence. The holes in the brick can be filled with rocks, gravel and sand to create thermal mass for absorbing solar energy. it will help warm the soil and release it back later in the evening. Here we go, done and ready for planting. I asked the kids to put the rocks they find in the holes, so it will take a while to fill, but the little ones always like something to do. 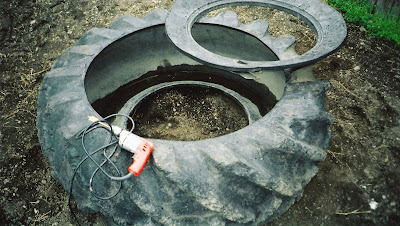 I'll show you how I used an old tractor tire in my next post. 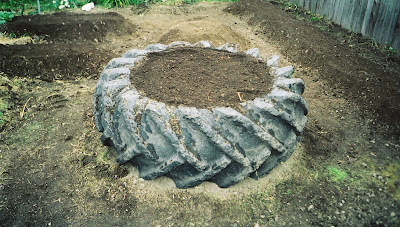 Here's a tractor tire I used for a raised garden bed. It was about 3ft tall and 5ft wide. You can find them for free from tire stores or in classified adds. I first needed to make a few modifications. I cut the top out to make more planting room with a reciprocation saw. 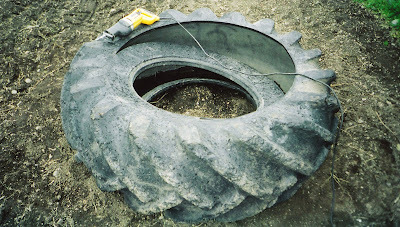 Here's where I placed tire with a "little" help. Finished cutting. 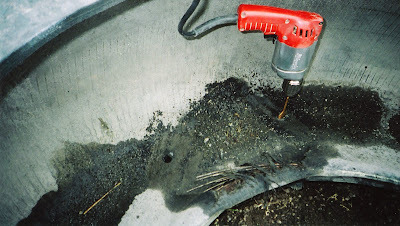 Then I got the drill out to put some holes in bottom sidewall for proper draining around the edges. I used the biggest hole bit I could find. A picture of the drill at work. Here's the finished raised bed filled with dirt. Remember the hardest part of these raised garden beds is the filling with dirt. Finally, I covered the ground with free wood chips from a local manufacturer. All done and ready for your planting. Till a 10x10ft square area and then scatter plant the peas by taking a pound of bush peas (I like "Little Marvels") and spread them evenly over the area. You can do this by simply throwing them out, tilling or raking them in. I usually toss them evenly over the area and then have the kids push them down to the first knuckle on their finger. Then just push some dirt over and pat them down or some people just walk over the area, that's it, you're done. 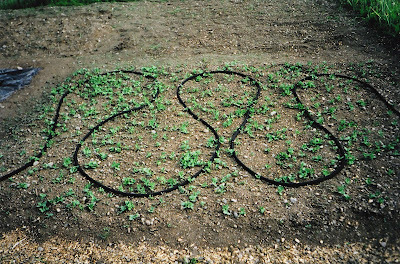 The peas will support each other and you should get about 50 pounds of pods. You can put these in as soon as you can get to dirt. I've put them in as early as February. It doesn't matter if it snows they will just lay dormant until it's time to go. This way you can get an early crop and if you do this in early spring you don't have to worry about watering or weeding. They pretty much choke out the weeds and because it's spring there's plenty of rain. I live in North Idaho and when living in a northern climate zone you need to use every trick you can to extend the growing season. Wall-O-Waters are a great way to do that. A Wall-O-Water is a series of plastic tubes that are attached together in a circle, that you fill with water, hence forming a wall of water around a plant. They basically create a micro climate or mini-greenhouse for the plant because water is one of the best storage and conductors of heat. After you plant the tomato plant, place a 5 gallon bucket over the top of the plant and then slide the Wall-O-Water over the bucket. Now fill the tubes with water as you se one of my sons doing here. Alternate sides to keep it balanced as you go. Here it is filled up. Now pull the bucket out. Bingo you're done. Here's a look at the tomato plant down inside. If the weather is going to be bad you can squeeze the top and it will form a tipi to protect the plant more. Here's one with the top open and one closed as a tipi. I usually put a few tomatoes out in March so I get a jump on the season. Remember to open up the tipi ones if the weather gets hot, I've fried a few plants before when I forgot about them. Also, once you're past the last frost and the weather is warm take them off. Also make sure you take them off before the plants get to big or you won't be able to. I hope this helps you get an early start on your gardening. I've used them for everything from cucumbers to watermelons. I never had good luck with melons in a colder climate until I started using these and now I can get big watermelons in North Idaho (just leave them on a little longer until the plant is busting out of them, but make sure there open at the top or you'll fry them). Building a raised garden bed is easier than you think. You can build them on top of grass, dirt, rocks, patios, roofs, wood, just about anywhere. But for this post, let's just say you want one in the backyard. You can build it right on the lawn and don't worry about removing the grass or sod it will just compost under the soil you place in the bed and help add to the soil quality. Not to mention worms like it and worms are a gardeners friend because they help aerate the soil. Now where you place the beds is the first consideration. You want the beds to get at least 6hrs of sunlight or more. I've had the most success with placing them up against a south facing wall or fence. This way you get some reflective sunlight and heat transfer. I live in the panhandle of North Idaho and so being in a northern climate zone, I need to maximize heat and sun to have a successful growing season. Because the beds are usually rectangle in shape, I would orient them so that the ends are facing north and south and the sides are facing east and west. This also helps your plants get maximum sunlight. Building the raised bed is easy, just about anyone one can build it. For the easiest and most cost effective plan, build a 4x8ft bed using standard lumber. For a basic design, use standard lumber either in 2x8, 2x1o or 2x12 size, in lengths of 8ft. For one bed you'll need just 4 boards, cut 2 boards in half or in 4ft lengths. Now, form a rectangle by placing the 4ft lengths on the ends of the 8ft lengths and you have a rectangle. You can nail them together, but I recommend you screw them together so they don't pull apart so easily. Also, I would recommend you place the 4ft ends on the outside of the 8ft sides, then screw them together, this will help prevent them from pulling apart because the sides take most of the pressure. You can also screw stakes on the inside of the boards to help them from pulling apart or spreading because of the weight of the dirt. You should now have a 4x8ft box. This seems to be the ideal size for a raised garden bed. You can make them longer (longer costs more), but I would not make them wider. 4ft seems to be the ideal width, so that from either side of the raised bed you can still reach the center. Any wider and people have a hard time reaching the center and then have to kneel or step in the bed or lean in with one hand down, hence compacting the soil. Besides, 4ft uses standard lumber size, doesn't waste any wood (just cut in half) and is therefore cheaper and more cost effective. Trust me on this one, don't go any wider than 4ft. Now if you don't want to bend over, you can always add another rectangle on top by building another box and then just screwing strips of wood on the inside to hold each level together. With 2x12 lumber, 2 levels seems to be enough and I definitely wouldn't go higher than 3ft. Remember, you still need to fill the bed with dirt and the higher you go the more dirt you need. Finally, fill your bed with some good garden soil (this is probably the hardest part of building a raised bed). Look in your local "Thrifty Nickel" or paper and you can usually find someone trying to get rid of manure, just make sure its aged and then just mix in some dirt. Here's a side view so you can see spacing, you want about 2ft between each bed so you can maneuver. NOTE: If you have it on grass, I would make sure it's big enough for your lawnmower to fit between. You can start with one bed, but I think 3 is the ideal for a small family. If you use treated lumber (like in the photo) or railroad ties, you'll need to line the inside with plastic. 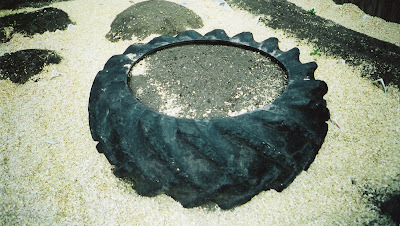 This will prevent chemicals from leaching into the soil. Here's some beds on the side of a house and one has a frame of sticks for the peas to climb on and another has boards nailed on the sides to make a frame for climbing plants. Building raised beds is easy and if you pay attention to your local classified ads, you can often find most of your material for free. This is just one way to build raised beds, in some later posts, I'll show you a few other ways.